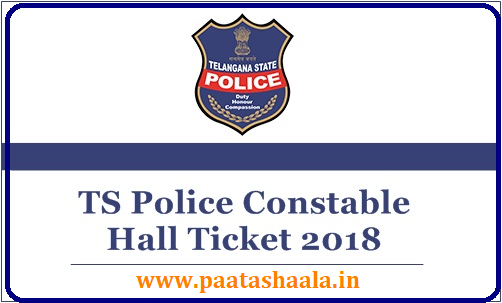 Telangana Police Constable Hall Ticket 2018 Download: TS Police Constable Hall Ticket 2018 will be released on 20th September. The Telangana State Level Police Recruitment Board (TSLPRB) has recently issued the notification 16,925 Police Constable vacancies. Many of the hopefuls have applied for the Police Constable posts in the state of Telangana. The TSLPRB is going to conduct the Constable Preliminary Written test on 30th September (10AM to 1PM). Hence aspirants applied for the TS Police Constable posts can get ready to appear for the test by downloading the hall ticket. The hall ticket will be released on TSLPRB Official website, tslprb.in before 10 days of the examination (approximately). Candidates have to compulsorily download and preserve the hall tickets safe to carry to the examination centre. Without showing the admit card/hall ticket candidates will not be allowed to appear for the examination. Hence candidates must download TSLPRB Police constable hall ticket and keep it safe to carry it to the examination. Telangana State Level Police Recruitment Board (TSLPRB) is the state level police recruitment board that announces various jobs for the aspirants wishing to get police jobs. The TSLPRB has announced the notification for 16,925 above constable posts recently. A large number of candidates wishing to become police constable in the Telangana state have applied for the announced posts during application dates. The TS Police Department is going to shortlist the aspirants by conducting the few tests such as physical eligibility test, physical standards test, written test, and interview rounds. Candidates clearing all these rounds will be essentially taken into consideration for appointment. Candidates applied for the TS Constable posts need to appear for the written test on scheduled dates. Candidates have to download TS Constable admit card to appear for the test. Telangana State Level Police Recruitment Board issued a Notification on 31st May 2018 for recruitment of 16,925 vacancies of SCT PC Civil and / or equivalent Posts and the Preliminary Written Test of the recruitment process is scheduled to be held from 10 am to 1 pm, on 30th September 2018 (Sunday) throughout the State. All the Candidates who have successfully uploaded their Applications are informed that the Hall Tickets for Preliminary Written Test (PWT) can be downloaded from 8 am on 20th September onwards till 12 midnight on 28th September 2018 by logging into their respective accounts on the TSLPRB website: www.tslprb.in by entering their credentials. Applicants required to download Telangana Police Constable Admit Card/hall ticket to proceed for the examination. Candidates will not be allowed to continue to the examination if they do not show the hall ticket at the time of verification. Candidates must also carry any of the valid identity proof copy along with the hall ticket while going to the examination. The hall ticket and identity proof of the candidate will be verified at the examination centre. On the hall ticket, the information of examination centre, date and timings of the examination and other details such as candidate’s name, identity/registration number, date of birth, signature, photograph and other details will be printed. Once verify all the details carefully after downloading the hall ticket. Candidates can report to TSLPRB for the necessary corrections if required. Check the hall ticket downloading process from the following and follow the steps to download the hall ticket. After downloading the Hall Tickets, Candidates shall take a printout of the same, preferably on A4 size paper on both the sides (so that the Hall Ticket is available on a single sheet paper). Though it is not mandatory to take the printout in colour, printout taken in colour nevertheless provides better visibility when compared to monochrome (black and white) printout. Once the printout is taken, each Candidate has to affix (with gum / adhesive – do not use staples / pins) his / her passport photograph (whose digital copy was earlier uploaded along with the Application Form) at the designated place provided in the left-bottom area of the first page of the Hall Ticket, without fail. How to Download TS Police Constable Hall Ticket 2018 Online? 6. Candidates shall carry only Black / Blue Ball Point Pens and Hall Ticket into the Examination Hall Digital Image and Fingerprint/s (Biometrics) will be collected during the Test in the Examination Hall. Hall ticket download to day time ?